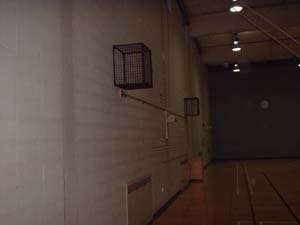 1/20/2002 - Helen Newman Hall is the athletic center on Cornell's campus. 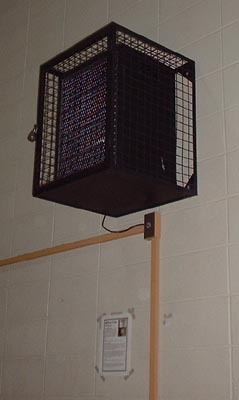 In the gym, as with most gyms, they have all the electronic equipment (lights, scoreboards, cameras, etc) protected with metal cages so they don't get struck by stray balls. 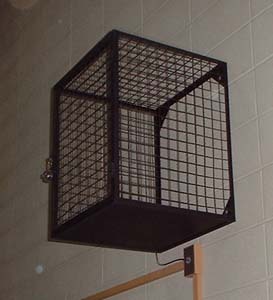 The question was, what could we put in these cages that would be funny? 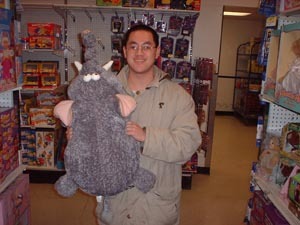 So Ton and Ben headed down to K-Mart, hoping that something would jump off the shelves. And lo and behold, we found a giant stuffed lion measuring approximately 2'x2'x'3'. An HTML version of the fact sheet can be found here. 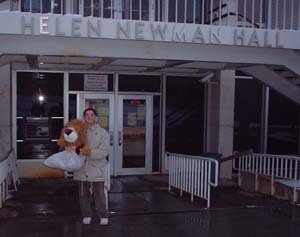 So then we headed up to Helen Newman with the lion in a garbage bag (we didn't have a big one, so it looks more like a diaper). 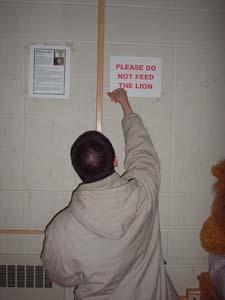 First we hung up the "DO NOT FEED THE LIONS" sign and the Lion Fact Sheet. 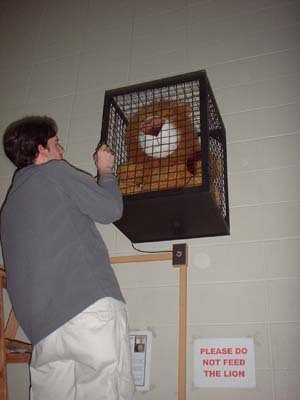 But then how to get up to the cage? Fortunately, there was a 10 foot ladder nearby. Don't ask why. We didn't. So Ben climbed the ladder, put the lion inside, and locked the door. A couple more pictures and we were outta there! Who knows how long those cages have been empty or what they are used for, or if anyone knows the combination of the lock... we'll keep you posted on the status of the lion. 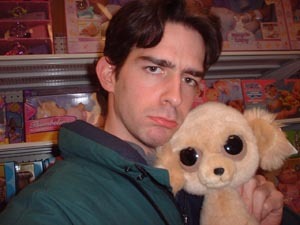 In the interim, you can help name him. 1/21/02 - It's been 24 hours now. He's still in the cage. 1/22/02 - It's been 48 hours now. He's still in the cage. 1/30/02 - It's been 9 days. He's still in the cage. I keep going there expecting something funny to have happened. Nothing ever has. But I'll keep checking. P.S. Why the heck hasn't this made the Cornell newspaper yet??? 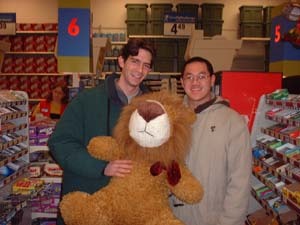 2/7/02 - THE LION IS GONE!!!! Just kidding. He's still there and he looks hungry. 2/13/02 - These updates are getting boring. The lion is not going anywhere. 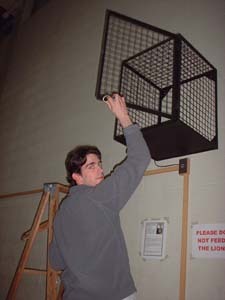 3/6/02 - Well, he's still in the cage. We weren't kidding when we said there was an unknown padlock on the cage! 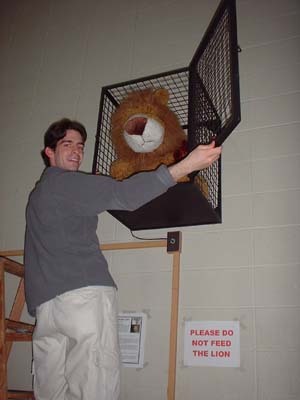 3/20/02 - The lion is still in the cage and he looks hungry! 6/4/02 - The lion is still there! Can you believe it? 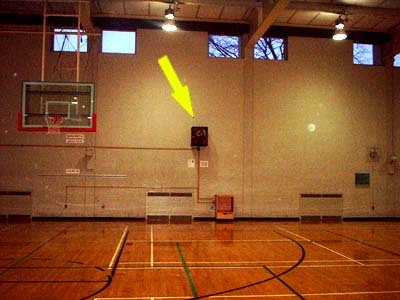 I was playing ball at the Helen Newman courts, and I saw something pretty strange - There was a stuffed lion locked in a cage on the wall, with a sign requesting that I not feed it. 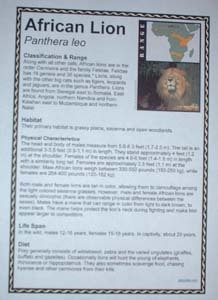 In addition to that, there was a placard with information about the African Lion. Now, I'm as interested in zoological tidbits as the next guy, but I'd like to know why the school put this up on my basketball court? Well, figure worst case, it made me laugh. Keep up the great work! 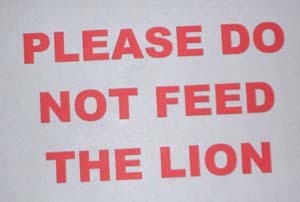 Andrea J. Dutcher, the Helen A. Newman Director of Recreational Services, says the lion has been so docile they almost forget to feed and water it. Not to mention healthy touch. No wonder it doesn't purr. She says it showed up around a freshmen orientation event and found a place in their funny bones, so they decided to keep it. "I suppose we should take it out occasionally to feed and exercise it but it hasn't roared loud enough to warrant that effort at this time. 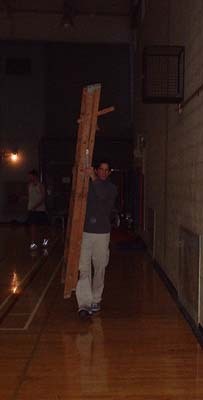 Unless anyone complains about animal abuse, I think we'll leave it there because it seems to enjoy overseeing the activities in the gym." Does it improve your game? 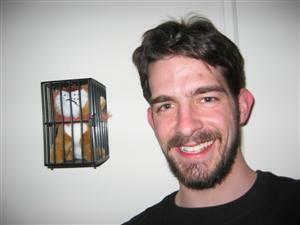 8/2/02 - Well, he's still in the cage. I could have a heart attack and die from !surprise. It looks like some magical wizard has turned our dear lion into a speaker! Oh no!!!! What will we do?!?? 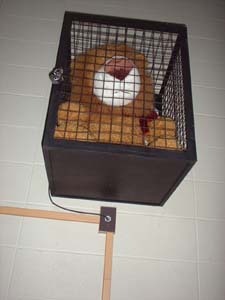 For the past year, there has been a very large stuffed animal lion in one of the HNH speaker cages, which hang about 10' up on the gym wall. We weren't really sure who put it there or why. 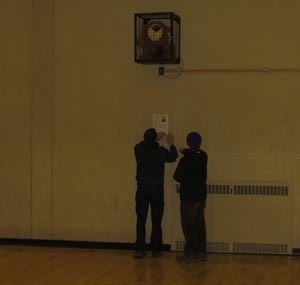 Everyone using the gym seemed to like it so we left it up there. 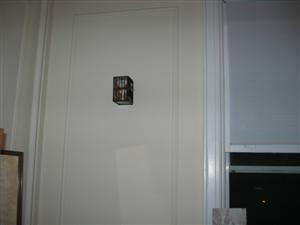 When we removed it last week for the first time to reinstall speakers, we found a name tag with your email attached to it. The lion is currently residing in 304 Helen Newman Hall. 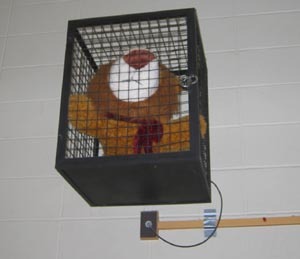 If you no longer want the lion, we would love to put him back up in the cage overlooking the gym. The e-mail was from Andrea Dutcher (whom you may remember from such Uncle Ezra postings as Q25345). Very cool, right? So our secret identity was exposed, but it's great that HNH is going to put him back up. He really did help my game, btw! Also, if there is any lesson to learn from this whole shenanigan: write your e-mail address on everything. It comes up seriously huge sometimes. 2/18/03 - This weekend the triumverate met at our alma mater and (after eating three (3!) Wegman's subs, we took a trip over to check out the lion. It looks like Andrea came through after all! 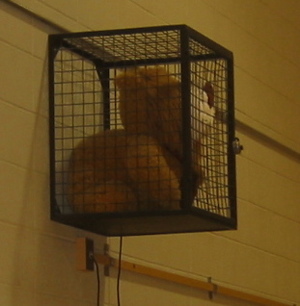 The gymnasium was completely remodeled and the lion was actually put back up, but in the other cage! He is even locked in again. Hooray! Check it out! They even plugged him in again, just like before. 10/25/2004 - It's been over 20 months since the last check-up in Helen Newman. And much to our pleasure, the lion is still there! Sweet! !